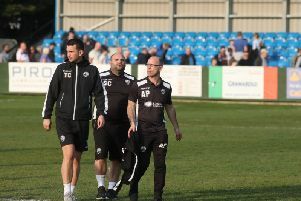 Steve Kinniburgh was delighted with his Corby Town players after they produced an impressive display to secure their play-off place in the Evo-Stik League South Division One Central. The Steelmen saw off another play-off contender Berkhamsted with a 3-1 victory at Steel Park as Jordon Crawford’s first-half strike was backed up by two more goals for Joel Carta after the break. The win means Corby are now assured of a shot at promotion during the extended season while they are also set to have home advantage in the semi-finals of the play-offs with third place all-but wrapped up as well. And, after a tough month which saw their title hopes fade, Kinniburgh was pleased to see his team finish March off on a high note. “I thought we were excellent, especially in the first half,” the Steelmen boss said. “I thought we really moved them about the pitch, we didn’t really give them a minute. “When we gave them the ball, we went and won it back quickly and we got the well deserved goal. “That 45 minutes is probably the best we have been this side of the new year. “We have dropped a few points in March but we had the good reaction at Thame after a couple of defeats and then we had the win against North Leigh when I thought we played really well and we played well again at Bromsgrove last weekend despite the result. “So we have been playing well over the last few weeks, we have just not been getting the rub of the green and the results going our way. There are still five games to play in the regular campaign and while Corby’s points per game ratio looks in good shape to ensure they will go up if they are successful in the play-offs, the manager is keen to ensure they don’t take their foot off the gas. “It’s put us into a good position where it’s looking like we are going to finish third in the table,” he added. “We have just got to finish the season off now.